Can you feel fall in the air like I can? This is the LAST week of August you know. The summer went too fast, but I sure love fall so I guess its a good trade. This pillow was made from some fall inspired fabrics with a pattern from Stitch magazine. Now its time to make a cute table runner to match. Last year about this time I made this table runner. It was the second thing I ever quilted myself and I was amazed it actually worked. Sewing and I were NOT friends before last fall…but more on that later. I have the most massive pile of laundry on my bed to fold and you can not even imagine how excited to be the lucky folder. Sigh. LLLLOVE the fabrics!! Are they all from the same designer, or is the grouping YOUR genius eye's doing?? ….Methinks I spy an Amy Butler print……? I love fall too and can't wait for it to come. Your pillow is wonderful! Very cute, very fall. That pillow is SO cute!!! You're going to hate me but I like anything laundry related… it's a sickness, I know. Love the pillow, I think I'm going to have to make one. I'm looking forward to fall too, I just love the colours and the crisp nip in the air! This pillow is definitely a fall cache of those colours. Yours is way prettier. The big button is my favorite! It's the added touch that makes the pillow special. The brown with white dots was an excellent choice too. I wish I had your sense of colors…sigh. Can't wait to see the table runner…maybe a lap quilt to go with the pillow (?). 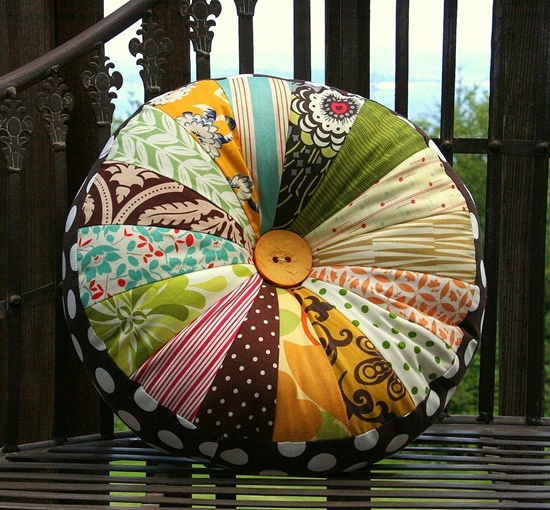 Love the pillow and LOVE the colors of the fabric! :) Nice job! That pillow just leaves me speechless…WoW! Is it a form or stuffed? This is the coolest pillow! I love the design! I have that magazine and forgot the design was in that issue. I especially love the fabrics you put together. Great job! Gorgeous gorgeous gorgeous!! What a wonderful stash you must have in order to pull together a palette like this one. Love the button accent, too!! i LOVE this pillow. the fabrics are GREAT! enjoy! I can't believe you only started sewing last fall. Amazing! Made a shirt based on a recent pillow of yours .. you're inspiring! Lovely pillow. You did a great job! If you hadn't said, no one would ever know that you've only been sewing for a year. You do fantastic work! Great job! I just love the fabric combination. Love it, great job! You can make one for every season. LOOOVE IT! GREAT JOB ALLISON! That is such a cute pillow! I need to get some fun quilting/sewing magazines, are there any that you would recommend as being better than the others? what stitch magazine is this from? You've come a LONG way in a year! Great job. I NEED that pillow…although I'm not to excited for fall. Where did the summer go? I agree, your version is way cuter. Can you tell us how you added the button? So cute! That pillow is so great Allison! You have such a great eye for fabric. It is interesting to know you have only been at it for a year. Gives me hope that I can one day be as successful as you! This pillow inspires me! Thanks. That! is an awesome pillow! love love love it. mmmm those fabrics!! !I am coveting, can I buy your scraps?joking serious! Your pillow is way better than the one in the book. I absolutely adore your pillow. I cant wait to see your table runner! I adore your pillow.When i saw it i just wanted to make one would you have the pattern. Oh I love it! Great job putting the fabrics together – that is of course the part I always struggle with. I need to be more adventurous! Ooh, the pillow is gorgeous. I recognize some of the fabrics but not all. Would you be willing to list the fabrics you used? I just love the color combination and the flow of all of the graphics. You did a fantastic job! Could you send me this pattern? I love this pillow! and what fabrics are these? yours is so much nicer, just beautiful! I love it,thanks for this post.. Your pillow makes me happy just to look at it. Great job. I usually don't talk to my computer when reading blogs. But, tonight I did. When I saw this pillow, I said "Ooooohhhhhh, Wow….." Love it! I'm going to have to go through my stash and find the goodies necessary to make this! I LOVE that pillow!! Methinks I have another project on my to-do list! OH my goodness- that is the prettiest pillow I have ever seen and I mean it. Thanks for the inspiration! The pillow is amazing! I too love all the fabrics together. Your pillow is stunning. We all would like that pattern. Any hints?